More than 20,000 Muslims are expected to gather at U.S. Bank Stadium Tuesday morning in celebration of the Islamic holiday known as Eid al-Ahda commemorating the sacrifice of Abraham. As such, the holiday, known as the “Feast of Sacrifice,” often involves the ritual sacrifice of an animal, though organizers of Tuesday’s event set to be held in the new Minnesota Vikings stadium have assured the public that no animals will be slaughtered inside the stadium. In attendance at the press conference was Dr. Waleed Idris al-Maneese, who leads the Islamic University of Minnesota and serves as the imam of a Bloomington mosque. His mosque has produced at least five Islamic extremists who have gone on to fight with either ISIS or al-Shabaab, according to WND. “This is the biggest stadium in the state. It can hold up to 65,000 people and we hope every one of those seats will be filled. We need to do this so we can show the unity of Muslims in America and the union of their efforts, and that is going to be a big open door for dawah, and to make well known the superiority of Islam,” Christian continued, translating Maneese’s remarks from Arabic. Due to the expensive nature of the event, a GoFundMe page was started to help cover the costs. Among the stated goals for the event are returning “to the way of our Prophet” and establishing the “Eid as a holiday for all Minnesotans,” according to the fundraising page. 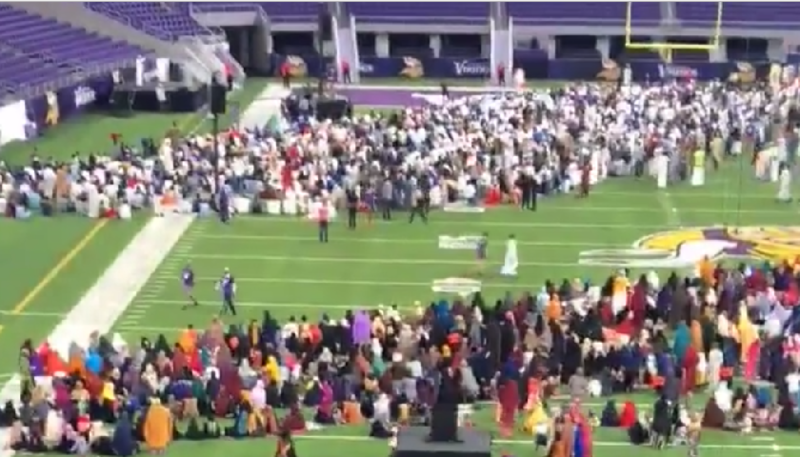 Early video from the event appears to show one imam chanting Islamic prayers, including “Allahu Akbar,” as attendants took to the field to join in prayer. Organizers of the event requested additional security from the Minneapolis police, and warned attendants and those commuting to work to expect traffic delays. My advice to Wisconsin, Iowa and the Dakotas: build a wall. They want a show of power. It’s a form of terror, scaring people – “see how many of us there are” and sometimes it works. It’s also considered dawa(h) or a type of Islamic proselytizing, a call to the faith, and precedes jihad. Osama bin Laden gave the U.S. a dawa call before the 9/11 attack. And last, but not least, the amassing of a large crowd bolsters the pride and resolve of the ummah, the collective community of Islam.